Who is the San Francisco Dungeon for? How often do the San Francisco Dungeon tours run? Is the San Franciscon Dungeon a show? Is the San Francisco Dungeon suitable for children? What is the minimum age the San Francisco Dungeon is recommended for? 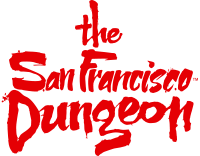 What items cannot be taken into the San Francisco Dungeon? Is there a dress code for visiting the San Francisco Dungeon?